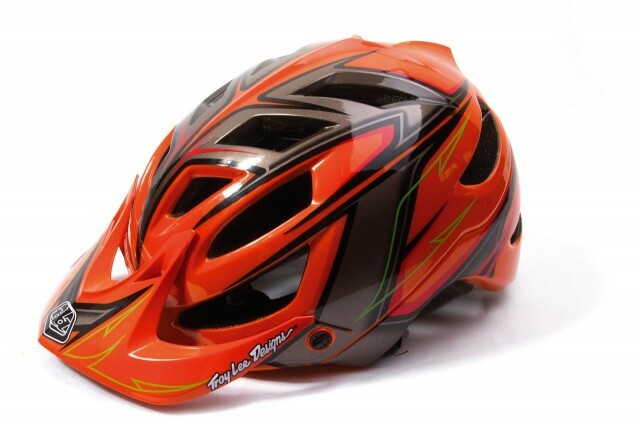 Troy Lee Designs A1 helmet. 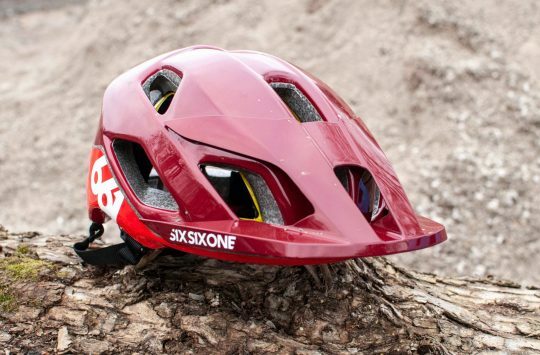 Last year saw Troy Lee Design’s (re-) entry into the all-mountain helmet market. After years of success with its full face helmets, it was only a matter of time before an open face helmet was introduced. With a range of eight different designs and colours the A1 can appeal to all riders – whether you like to go for a stand-out bright colour or like to keep it fairly low-key, there’s something available to suit your style. A reinforced polycarbonate shell in-moulded with the EPS liner extends down the sides and back of the head for maximum protection and durability. Having the support down the back of the head and just above the ears is great – it feels safe and secure once on. Strength and high impact resistance have made TLD’s great reputation what it is today, and the new A1 doesn’t change that. My first impressions of the helmet were great. I went for the bright ‘Turbo Orange’ version… not to everyone’s taste, but I loved it. Setting up the helmet was easy: once it’s on, wind the cradle in until it’s snug and comfortable, then have a fiddle with the strap. A triple-position adjustable retention system allows customised fit for various sorts of eyewear, head shapes and riding styles. After adjusting the helmet to suit my head, the A1 felt secure, comfortable and ready to get dirty. During the test I wore it for pretty much everything except serious downhill; from short trail rides to long cross-country loops, my head stayed nice and cool thanks to the eight air intake passages supplying great all-round ventilation. After a few weeks of riding I was blown away by the A1’s all-round comfort and fit. The one thing missing was an impact test and because I am that thorough a product tester, I thought it would be a good idea to go over the bars onto ye old noggin to stretch its abilities to the max. I picked the perfect steep roll in, finishing with a fair-sized rock at the bottom; choosing to jack myself up on the rock and go over the bars. [Dan is using the loosest definition of ‘choosing’ here. – Ed.] 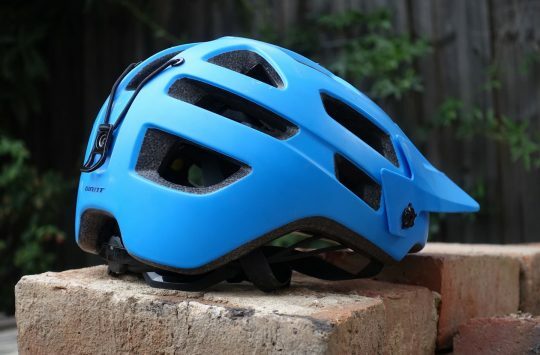 Under the initial impact the helmet stayed strong and in position on my head – one thing that really impressed me was how it stayed securely in the same position and didn’t roll when struck. However, I forgot about my bike flying behind me, and before I could get up I inevitably received a second hit to the head from – of all things – the bike’s cassette. Under this second impact the helmet still felt secure and I didn’t feel any pain from the blow; however, I did hear a cracking sound. After I’d picked myself up and inspected the lid, sure enough, just above the visor, a chunk of helmet had been eaten up. Luckily for me the A1’s high impact protection had worked and had prevented a serious injury. This unfortunately did mean the A1 was broken and not safe to use any more. Even though the polystyrene wasn’t cracked there were still a few pieces missing, which meant the helmet had lost some of its integral strength. Thankfully Fishers will provide a crash replacement at a 30% discount off the full retail price, so if you are an A1 owner replacement should at least be less painful than the crash. Overall: For me the A1 helmet is outstanding, adjusting easily to fit without causing any unnecessary discomfort. Providing great ventilation, you almost forget you have it on and having given it a good impact test, it’s proved it’s up to the job. 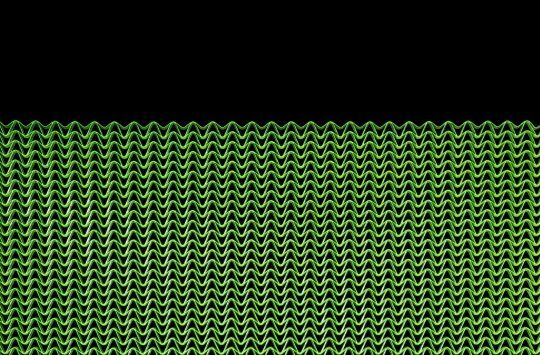 Tested: by Dan for Two months. I love the A1, but it’s one of those lids that looks much better on other people’s heads, I find.